A century ago, sending the gift of flowers was a challenge - the longer the distance, the greater the problem. Today, Fleurop makes it quick and easy, the world over. The story of how this level of excellence was attained is an interesting one. 1927 - Fleurop (Flores Europae) was founded by Belgium, Germany, the Netherlands, Austria and Switzerland. 2017 - Today, Fleurop-Interflora processes over 25 million orders each year. The idea to create an organisation that would deliver flowers in other towns, or even abroad, was the product of two developments. Firstly, the growing demand: more and more people had friends and relatives living quite some distance away. To nevertheless delight them with a floral gift, the flowers had to be carefully packed and entrusted to the postal service. The problem with this procedure is an obvious one: the longer the distance, the more likely the flowers arrive in less-than-perfect condition. The equally obvious solution: find a way to transmit the order to a florist at the recipient's location, who will then prepare and deliver the flowers. Which brings us to the second development - that of the telegraph and telephone. At the beginning of the twentieth century, a number of resourceful individuals in the flower trade decided the time was ripe for a flower delivery network. The originator was Berlin florist Max Hübner, who introduced the so-called "German Flower Gifting Service" in Germany in 1908. He discussed the idea with his colleagues, who swiftly grasped the potential inherent in a service of this kind. A total of 98 flower shops joined up within the first year. A short time later, the idea came to the attention of florists in the United States who, in 1910, founded the Florists' Telegraph Delivery (FTD) network. In 1925, the FTD expanded its network to include an international service, the Florists' Transworld Delivery network. A few years after its establishment in the USA, the FTD decided to reinvent Mercury, the Roman messenger god, as the symbol of swift floral deliveries and official corporate logo. Today, the Mercury Man is a global presence and has become one of the most iconic company logos worldwide. The British flower trade embraced the idea of transmitting flower orders by telegraph in the 1920s. An innovative florist in Glasgow and a tree nursery owner in Essex applied for membership in the American FTD as foreign members. Their request was granted, and by 1923 no fewer than 17 British florists had become FTD partners, enough for the US organisation to decide to set up the British Unit, a branch organisation operating under the umbrella of the FTD. 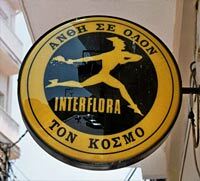 The name was changed to Interflora British Group in 1953. In the meantime, Max Hübner - the florist who had launched the first flower gifting service in Berlin in 1908 - was living on Zurich's Bahnhofstrasse. He had met, courted and married a Swiss woman, Klara Krämer, and was running the Krämer flower shop there. The shop is still doing business today. Hübner was determined to expand the flower delivery network further, and by 1927 he had secured the collaboration of 3,064 florists in Germany, Austria, Switzerland, Holland and Belgium. In the same year, Fleurop (the name is derived from "flores Europae", meaning the flowers of Europe) was founded as an internationally oriented organisation at a gathering in Zurich's Kursaal. Max Hübner was unanimously elected as the first president of the European Fleurop organisation, and Zurich was chosen as the location of its first head office. Interflora Inc. was founded in Copenhagen in 1946 to boost business in the wake of the Second World War. This floral delivery network with its global operations was created through the merger of Fleurop (for continental Europe), the Interflora British Group (for Great Britain, Australia, New Zealand and South Africa) and the FTD (for North and South America and Japan). The fleurin was introduced at that time, an in-company currency created to simplify the internal payment system. Initially based on the Swiss franc, the fleurin has been pegged to the euro since November 2003. The founders also decided to establish the Mercury symbol as the company logo; it has become a familiar sight all over the world. Interflora Inc. operates from its headquarters in Southfield (Michigan, USA). 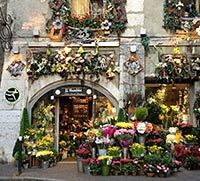 Fleurop-Interflora is the world market leader and best known flower ordering service in Europe, supported by over 50.000 carefully selected affiliated flower shops in over 150 countries. In Austria, Fleurop prospers for more than 85 years and is - despite increasing competition - the undisputed market leader.